I'm going to change the MDF for something more sturdy soon. But even like this, works like an absolute charm. And with a bit more work put into this construction, voila- pin router! Electric planer - I bought this because I really don't like using a hand plane. I haven't had much experience of using them, and I'm quite bad at it. I thought that an electric planer might be the solution. In practice, it's not very satisfactory for this type of work - I think they are more intended for things like planing floorboards or other larger work, because it's not terribly accurate and I get snipe (i.e. when a planer cuts a bit deeper at the start or end of the piece). Perhaps this is because I bought a cheap one (an Einhell TC PL 750), although it has reasonably good reviews for a cheap tool. Angle Grinder - I have a Bosch PWS 600 that I bought some years ago, when we bought our house. I haven't actually used it for working on guitars yet but I will try at some point. They can be useful for making body carves, or - if you're very brave - for carving necks. Thicknesser - I decided to push the boat out on this one because thicknessers aren't cheap, and in fact this is the most expensive tool that I have bought. I went for the Triton thicknesser, because I've seen very good reviews of it and it's still relatively affordable, as these things go. My concern was that the literature says it is adjustable in 1.6mm increments, but that is misleading because that just means one full turn of the handle makes 1.6mm, but you can turn it as little as you want. The other factor was the width - they tend to come in widths from about 30 to 33cm, which is generally just a bit too narrow for a standard guitar body - there is one (from Lumberjack IIRC) that is a bit wider than the Triton's 317mm, but that's a small, shop-owned brand and I was concerned about quality & support. In the end, I made the padauk strat's body a bit narrower and it just went through (to the mm! ), and other guitars will mostly have 2-piece bodies so I just need to thickness them before I glue them together. In practice, this is a fantastic tool and if you have the budget I highly recommend it. It saves huge amounts of time and can be very helpful. I used it recently when I made strips out of various pieces of wood for neck laminates, as well as thicknessing the body for Sunrise (there will be more news on that soon). It planes the wood really well, and you just need a fine sanding afterwards. Without a thicknesser, you have to mess about with other (electric or hand) planes, or build complicated router jigs or something, depending on the job. The thicknesser just gets the job done in seconds. Wonderful! Here's a bonus piccie of my thicknesser sitting on top of the rolling chest of drawers that I made for my workshop. This is its resting place when it's not in use, in a corner of the garage under my network cabinet, and when I need it I just roll the drawers out into the middle of the garage, plug it in and play! You can also see the corner of my main workbench with the piece of glass I mentioned, which is currently stuck to the bench (I want to fix it into its own frame soon), and my roofbox on the shelf above the network cabinet. Space is at a premium in my garage / workshop! That's an impressive network cabinet for a domestic installation there @GloopyJon . While talking about safety: I used to operate a Paper Guillotine in a printing factory once upon a time. The safety cut off was both fast and impressive. The older models had a moving guard that would literally throw you out of the way once the hydraulic clamp stated to operate. Later models had light guards and a brake that would stop nearly a tonne of moving parts in an instant. In fact all the machines in the factory had physical or electronic guards to stop the operator getting anywhere near anything clampy, cutty or nippy. The lack of safety features on both industrial and home style woodworking equipment horrifies me. I guess @Poseidon, being a butcher has double the chance of losing fingers so is already doubly careful. Thanks As a slight aside from the main topic, when we bought our house it didn't have network cabling but I replaced some of the existing cable TV and telephone cables with Ethernet cables, by pulling them through the cable runs in the walls. In one or two places I had a handyman cut channels in the walls to run network cables to other places. I managed to get most of the house networked up, and the network cabinet contains the patch panel, a 1gb switch, a Synology NAS, my router and one or two other bits of gubbins. It's worked very well so far although I hate to think how much dust has got in there recently! Yes, we do have wifi in the house, but all of my experience shows that cable connections are much, much, much, much, much, much, much, much, much, much, much, much better, both in speed and reliability! I would still install cables if I bought another house now. Back on topic...a post or two about hand tools will be coming soon, and that will complete my main contributions to this thread! I had my first extensive play with the Bosch bench drill today, using it to drill out the holes for the weight relief for my Sunrise bass. I'm very happy with it; it has so many features that just make it a big step up in usability from a standard pillar drill. The built-in clamp was very useful for keeping the body fixed in place, and the electronic depth gauge meant that I could easily drill to the same depth without having to set a physical stop and worry about it slipping. It's easy to use with the big rubber wheel, and you can set it to virtually any speed - I had it on the slow gear today with my Forstner bits. It's a superb tool, and I'd certainly recommend it to guitar builders. True, it's more expensive than a basic pillar drill, but I think for the increased quality and features it's well worth the extra investment. Not really a tool, but you just gotta love MDF! I have planned some smaller "jig building" projects that I'm going to post in this thread. Those blocks are 28cm long, 5cm wide and 3,2cm high. This equals the length of a standard sheet of sanding paper, the width of double sided tape and two pieces of 16mm MDF screwed together. I also added some bevels to make them a bit more comfortable to handle. I still need to write about hand tools at some point - I'll get around to that one day! In the meantime, I've been radiusing the fingerboard for my bass over the last couple of evenings, and finding it a very laborious process. I first had a go with my new belt sander to try to take off some of the bulk, before using a radius block with 60 grit sandpaper. That has been horrendous, though - I've been sanding away both last night and tonight, and it still isn't quite there. 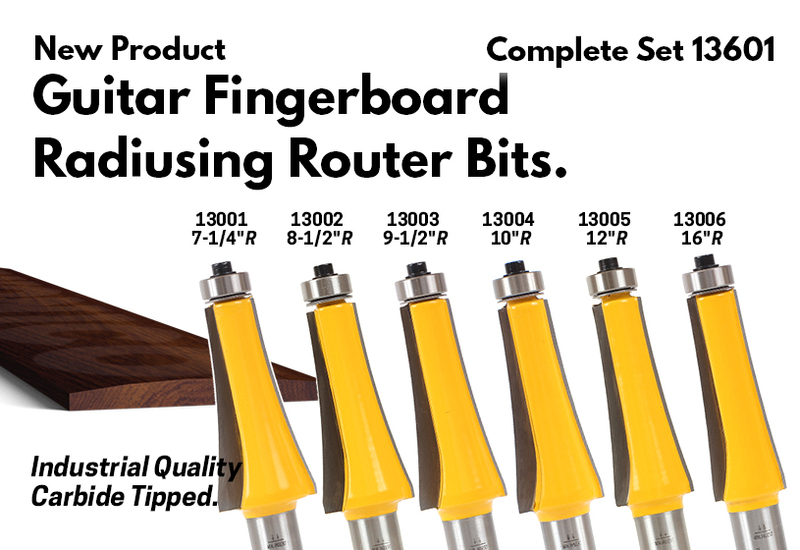 So having got heartily sick of that, I decided to take the plunge (router) and order a set of radiusing router bits. They are quite a new thing, and I've seen very little about them, but I reckon they're worth a try for the potential savings of time and effort. Of course, I'll have to do a bit of sanding afterwards to finish it off, but in principle that should be much quicker. I'll report back when I've tried one out, but that won't be until the New Year since they will take a while to arrive.. I''ve pasted in a picture below to give you an idea, and this is the Amazon link. Here is a YouTube video showing a similar router bit (not from Yonico) in action. How are you planning to route the radius with those bits? Before gluing when the fretboard is still square? Yes, exactly. You need to draw your centre line on the fretboard, and align the top of the cutting part of the bit with that line. Then you need an edge which is parallel with that centre line - you can do that before you cut the sides of the fretboard &/or neck, or you can mount it temporarily on another block. Then you run the fretboard, mounted on the neck or a block, along a fence whose surface is aligned with the bearing, so that the radiusing part of the bit sticks out and will shape the fretboard. Mounting it on another block is essential for safety, at least, because you don't want to have your fingers as close to the router bit as a fretboard's width! You do that once for each side of the fretboard, i.e. do one half, then flip it over and do the second half. I don't expect it to give a perfect result, but it should be much quicker than sanding from scratch, and much closer than using a plane or a sanding belt, and then it should be pretty quick to finish it off with sandpaper on your radius block. The whole set was £95 which isn't cheap (although that's not very expensive per bit, because router bits can be rather costly). However, if I just started with one - which would have cost about £25 - and it was successful, I'd need (most of) the others anyway and it would end up costing more. I reckon that this will save me a good hour of hard labour on each fretboard, and it's the sort of job that I hate doing because it's boring, repetitive and slow, and also quite tiring. With this, if it goes according to plan, I reckon on five minutes to set up the router and do the two passes, and then five minutes to sand it and get rid of any irregularities. One more note to myself on this is that it's probably a good idea to do this before the fretboard is cut down to the desired length, in case you get some wood chipping out at one end (which often happens when routing). If you have a few cm extra, that's not a big problem, but if you're already down to the length then you have to glue it back in or fill the hole. Obviously, I will report back when I've tried it. I might even make a YouTube video about my first experience, since there is very little information available about using these bits at the moment. I did suggest them to Crimson Guitars and James said that they would think about buying them and having a go, but that was a few months ago and I haven't seen anything yet - I suspect it's dropped off their radar. I promised to talk about hand tools a while ago and haven't got around to it until now. Unfortunately, the timing is bad because I'm not at home today so I can't take more pictures or check all of the details of what I have, but here is a picture of my tool wall which has most of my commonly used tools hanging up for easy access. The tool wall is simply a piece of plywood that's screwed to the breeze blocks in the garage wall, with nails hammered into it to support the tools. I looked at commercially available ones, and concluded that a home-made solution was cheaper and at least as versatile. The racks along the bottom are just pieces of cheap pine with some holes drilled into them - again, it's extremely useful to have most of my drill bits, screwdrivers and chisels mounted like that. I'm just going to run through the items here without really making specific recommendations for most of them, since they are largely standard items. The main exceptions are a few specialist luthiery tools, mostly purchased from Crimson Guitars. Standard tools that are useful to have around include the hammer, wrench, pliers, Stanley knife, hack saw, a variety of screwdrivers and a set of chisels, plus a good range of drill bits. You'll also want to have some screws and nails hanging around, but probably more for making jigs and ancillary items than for the guitars themselves, since you may want to buy specific screws for the guitars. I also have a set of large files and a set of needle files in other places, which see regular use but for which I don't have space on my wall (yet). The most important tool that's not hanging on the wall is my plane, which is a Stanley No. 4 1/2 which seems fairly decent. I'm considering acquiring a larger plane, maybe a No. 6, but I'm holding back on that. You also need various rulers, a protractor and at least one accurate set square - I have a small one which so far is sufficient, although a second, larger one would be useful at times. The tape measure isn't especially useful for guitar builds; an accurate straight edge is essential (I have one which isn't shown, bought from GNW). The long tweezers, below the pliers, are useful to have around, particularly when soldering. Masking tape - obvious if you've watched any of the Crimson Guitars videos! Also behind that is my set of cabinet scrapers, which are occasionally useful, and a scalpel, which is necessary for inlays. Just above those are my ear protectors and a winder that came with my router, for use when it's mounted in a table. You can also spot the two main glues that I've been using, which are superglue and Titebond Original (which seems more appropriate than Titebond II or III). I have a tin of lighter fluid (naphtha) for cleaning the wood after sanding or similar operations. Digital caliper - a caliper for precise measuring is essential; digital or mechanical is your choice. Spoke shave - not specifically for guitar-building, but can be a good option for shaping a neck. Fret saw and jeweller's saw - as mentioned in an earlier post. Fret file (between the jeweller's saw and the Shinto rasp) - bought recently, haven't tried it yet but I hope this will speed up fret crowning. It has concave, diamond-encrusted sides for small/medium or medium/jumbo frets. Shinto rasp, half-round rasp - both from Crimson Guitars, great tools for removing wood quickly and shaping the body and neck. Notched straight edge - with notches for frets, great for checking if the neck is straight. This is a handy tool for all guitarists, not only if you are making guitars, because it tells you if you need to adjust the truss rod. Fret rocker - necessary when you're levelling the frets, as it clearly indicates any high frets. Also useful if you have a guitar that's buzzing and you want to identify the problem - again, a handy tool for all guitarists. Radius gauges - I have a set of these for checking the radius of the fretboards. Again, absolutely necessary - at least for the radiuses that you make. F-clamps - lots of these, I found some cheap ones on Amazon that aren't bad although the plastic handles are a bit flimsy. I got lots of 6" clamps and a few 12" ones, as well as a couple of smaller and larger trigger clamps that came in a cheap set. G-clamps - I had a couple of 6" g-clamps. They are stronger than the f-clamps, but the latter are a bit easier to use. I also recently bought a couple of g-clamps with deep throats that will reach the centre of the guitar body, mainly for when I want to glue a cap onto the body. Sash clamps - I have three 24" (60cm) sash clamps, mainly for when I glue together the halves of a body although they have come in useful for other things too. These should definitely be on your list. Spring clamps - I have a variety of these which are handy for certain jobs, although they don't exert a lot of pressure so I don't recommend using them for gluing operations. I use them more just for holding things in place when I need an extra hand. Woodworkers often say that you can't have too many clamps. Obviously this is a bit of an exaggeration, but it's certainly good to have plenty of them, and a good variety. I've probably spent around 100-150 pounds on clamps, and those were all cheap ones. I wouldn't like to have much less than that. When I'm back home, I'll dig around and see what else is hidden in my cupboards that I use fairly regularly. I also have a box with compartments that I've filled with various guitar-related small items, mainly the electrical parts, knobs, and small things like jack plates, screws and the like. I'll post a photo of that soon. It's time for a quick update on this thread because although I already had more or less what I needed by the end of last year, I have still been periodically adding new or improved tools. Here's a quick rundown of the main ones that I can think of! This is prompted by the fact that I've ordered some new files today. (1) Band saw - the Einhell band saw gave me a lot of trouble. It kept snapping blades, and wasn't powerful enough for everything I wanted. I finally caved in and bought the same one as @Poseidon which is a Record Power BS300. It's much more expensive and significantly more powerful, although since it has a bigger blade it's not as good at curves. I need to buy some different blades for it but I haven't got around to that yet! (2) Drill - I have bought a second cordless drill to avoid having to swap continuously between two bits. (3) Drill bits - I got a set of drill bits going in 0.1mm increments from 1mm to 6mm. This is fantastically useful since it allows me to always drill a hole that's exactly the right size for the screws. Before getting these, I had a lot of problems with this, particularly in harder woods, and these bits have helped tremendously. (4) Palette knives - just a couple of cheap ones, but they are very handy for mixing and applying things like glue or wood filler. (5) Two more planes - a small block plane, and a big no. 7 plane (bought from Ben Crowe when I was last at Crimson Guitars). They don't come out every day, but they are good to have when needed. I could use another small plane, and one where the blade is at the front so that you can plane into corners. (6) Better routing bits for my Proxxon multi-tool - I've bought some of the Proxxon milling cutters. The 3mm one is great, so much better than the cheap ones that come with the tool! The 1mm cutter broke almost instantly; I have since bought a 2mm cutter too but haven't used it yet. (7) Bench Planer (aka a jointer) - I bought a cheap, Silverline jointer to help with the preparation of flat joints. It's not bad; it gets close but I still generally have to use a hand plane to get to the stage where I can glue joints. Not quite as good as I'd hoped, but OK.
(8) Sharpening stones - I bought a pair of stones, a diamond plate and a thingy for holding blades at the right angle of dangle. This topic merits a long discussion on its own but I'm not going into that right now! (9) Files - I have a cheap set of needle files but I'm currently working on some inlays and finding that they aren't very effective. I've ordered half a dozen new files from a specialist website, and each one of them costs about the same as the whole kit of six that I've been using. I'm hoping that they will be correspondingly better. I also ordered a couple of the smaller Iwasaki files, since they are sized between the needle files and my larger Iwasaki file and Shinto rasp. I can see how people build up a huge collection of different tools, because there are so many little tasks where a different tool can come in useful. Also, it's clear that cheap tools are really not suitable for anyone with aspirations to professional-level work (or anywhere near), and you have to dig a bit deeper into your pocket to get satisfactory quality. As well as the tools, there's a tremendous amount to learn here if you're a noob, as I was (pretty much). The more you learn, the more tools you see a need for too!